Solid-state drive overclocking. Coming to a drive near you soon. Ish. Maybe. Intel is overclocking its SSDs for fun. 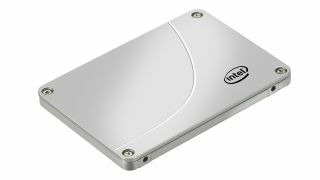 As promised, Intel demoed solid-state drive (SSD) overclocking on the first day of IDF 2013 in San Francisco, but sadly it's little more than a lab experiment right now. Using a Clevo W740U laptop, Dan Ragland, Senior System Engineer showed off an unreleased version of the Extreme Tuning Utility (XTU) complete with the experimental SSD overclocking tab. In that new section is a pair of sliders allowing you to change the frequency of both the memory controller as well as two frequency levels for the NAND chips themselves. Ragland pushed the Intel SSD's memory controller up from 400MHz to 625MHz and then ran the AS SSD benchmark to demonstrate the performance benefits. For the extra 225MHz overclock, we saw the SSD delivering around a 10% performance boost. That was an overall benchmark score though, not covering the different workloads that SSDs perform. I asked whether that 10% boost worked across the whole SSD range - whether it increased sequential read/write as well as random 4K speeds - but Ragland was a little cagey in his response. Intel intros new Atoms – but can it break into the tablet market? "I gave you a snapshot of one benchmark, it varies," he said. "There are some areas where you'll see a whole smattering. To be honest, we're just playing with it in the labs, we're still in the experimental stage at the moment." I followed up with a spokesperson from the NAND Solutions Group (NSG) about whether the performance benefits could be worth the risk to your data. "Any risks you take with your data in overclocking the memory controller has to be monitored," he explained. "But we have those monitors." There are system monitors embedded in the SSD controller tech that measures error rates across the NAND memory chips. If the undetectable bit error rates (UBER) start rising then you'll be incurring elevated stress levels on the NAND – at that point you're going to want to start winding your overclock back in. Whether those same system monitors will work when overclocking the NAND chips though is still unclear. But as the representative from NSG explained: "Controller overclocking is what you want – the intelligence is in the firmware and you don't want to stress the NAND so much." But it's still an intriguing new arena for overclocking. And with newer memory controllers, especially the multi-core variants Intel is working on, we could see some genuinely tangible performance benefits from SSD overclocking.